Author: Susanne Epple. Series edited by: Thomas Bierschenk, Anna-Maria Brandstetter, Raimund Kastenholz, Matthias Krings, Carola Lentz. Among the Bashada of Southern Ethiopia, individual misdeeds and wrong-doings are expected, especially when it comes from children and adolescents, as it is believed that misbehaviour is part of human nature. To prevent them from harming themselves and others, chil­dren, adolescents and adults have to be guarded, and guided, and also sanctioned by their age-mates and seniors. As unresolved con­flicts are believed to bring about misfortune and cause disasters such as warfare, sickness or droughts, disturbed social relations are usually mended through social sanctions. In her research Susanne Epple examines the specific social roles individuals achieve or are ascribed to during their lives. She looks at the specific modes of communication used to articulate, confirm and strengthen social relations between chil­dren, adolescents, adults and elderly people of both sexes. In this context, she shows that the existing age-set organisation has an influence on all members of Bashada society. While the relationships between adult men as members of the different age-sets are clearly defined and interaction between them follows certain rules, the relations among children, adolescents and women follow the principle of seniority in a more general way. Besides giving a close insight into Bashada lives, the author offers a new perspective on East African age-set societies. Among the Bashada of Southern Ethiopia, individual misdeeds and wrong-doings are expected, especially when it comes to children and adolescents, as it is believed that misbehaviour is part of human nature. To prevent them from harming themselves and others, children, adolescents and adults have to be guarded, and guided, and also sanctioned by their age-mates and seniors. As unresolved conflicts are believed to bring about misfortune and cause disasters such as warfare, sickness or droughts, disturbed social relations are usually mended through social sanctions. In her research Susanne Epple examines the specific social roles individuals achieve or are ascribed to during their lives. She looks at the specific modes of communication used to articulate, confirm and strengthen social relations between children, adolescents, adults and elderly people of both sexes. In this context, she shows that the existing age-set organisation has an influence on all members of Bashada society. While the relationships between adult men as members of the different age-sets are clearly defined and interaction between them follows certain rules, the relations among children, adolescents and women follow the principle of seniority in a more general way. Besides giving a close insight into Bashada lives, Epple offers a new perspective on East African age-set societies. The present publication obviously follows the tradition of the renowned anthropology department situated at the Johannes Gutenberg-Universität Mainz with its focus on the many ethnic groups of Southern Ethiopia. The research focuses on the Bashada, and, the main attention of the publication is given to the age set formation of this group. Different to former anthropological researches, the author demonstrates the implications the naming of a certain age group has on the political structure or the ritualistic background of the ethnic group, and also its implications on daily interactions. [...] In general the study is very well researched, very well written, and very well theoretically grounded. Its detailed description of structures, its many and rich examples, and its deep analysis of the interconnection of day to day life, political and social life, as well as ritual life are extremely valuable for further researches. There are amazingly few mistakes in the English text and the index is a very useful tool to work with. I can only congratulate the author to the fine work of anthropological research. This monograph on a southern Ethiopian people appeared a few years ago but may not have received the attention it deserves. 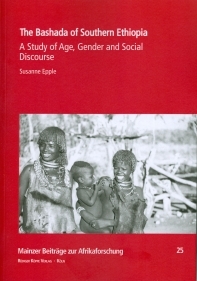 German anthropologist Susanne Epple has written a remarkable ethnography of the approximately 2,600-strong Bashada people, an agro-pastoralist group in the south-west Ethiopian plains east of the Omo River, which she studied on and off since 1994. [...] While many ethnographic studies on this now rather well-documented part of Ethiopia have focused on politics, conflict, violence and livelihood changes, this study takes a different approach, offering a sustained analysis of the Bashada’s social organization and social and gender relations through the spectrum of their age organization. The result is a very rich and detailed study that evokes admiration for this society, and shows the author’s fieldwork skills.